GSoC is almost over now. Lots of cool things have happened, but unfortunately you may not be aware of it, because I have neglected to blog about it. That is definitely a regression compared to last year and something to keep in mind in the future. I managed to do almost all tasks from the project plan with priority higher than 4, with some rough edges there and here. Next I will pick some highlights from the completed tasks. This year there were many usability related issues to improve the translation work flow. The improvements done by Wikimedia Usability project nicely complements my work for the benefit our less technically oriented audience. Most important improvement is probably the buzzword compatible ajax-editing. No more do translators need to open new browser tab for each message they want to edit, but instead they get floating dialog inside the current page (implemented using jQuery dialog). This means they never need to leave the list of messages any more, but it stays always in the background. It also makes easier to do quick edits to message documentation or other languages, because you just get a new dialog, and once you finished editing it, you are back in the previous message. Other features to include user preference to choose additional languages to show when translating. The feature itself is not new, but now users can customise the list of languages. Languages can be selected from the dropdown and using the button or typing in the language codes directly. To date we not really taken advantage of achievements in language technology. Now we have taken the first steps towards it by implementing a simple translation memory. It is a very simple setup, where we use tmserver from Translate Toolkit and fill it from time to time with existing translations from translatewiki.net. Tmserver uses well known Levenshtein algorithm to give suggestions. It isn’t very good, nor anything compared to state of the art systems, but the suggestions have already been useful, as told us by the translators itself. There is many ways to improve the suggestions from better algorithms to using larger set of translations as source data and preprocessing the source data (text alignment, case and punctuation normalisation). I’m looking forward to them. There were many improvements to the lesser used features. Special features (magic names, special page alias, namespaces) can now be exported using a script. No more time wasted in copy-pasting. In addition it is now possible to localise magic words for extensions. It is up to translation teams to decide, whether they want to do this understandably controversial thing. In message checks there were at times false positives which caused confusion among translators. Now there is flexible system to suppress those warnings. Gettext-style plurals are now supported better, but no one of our Gettext projects is currently using those yet. Related, there is now a special page to import offline translations. We can now give trusted translators or users the permission to import offline translations, delegating them away from server admins. It supports download-from-url, files uploaded to the wiki and local file uploads. The offline importer actually uses the same engine that I developed for another feature: web based message group management. It is now possible for project admins to import external changes, fuzzy other changes if necessary using their browser. It is much easier than doing those steps manually on the command line, but there is still some practical problems to solve. One major piece still missing is integration with version control systems, so command line access is still needed to do svn up or similar for other systems. It is somewhat related to the other problem, which is limited execution time for web requests. It is currently wise enough to check after every action if we are near the limit, and stop further processing and give the user ability to continue from that point. We can’t increase the execution time limitlessly, but there might be hope for example by doing multiple requests with ajax to spare the user from clicking continue button many times. There is always something to be done or something that can be improved. I will target on improving the new web interface and group management, which is still quite immature. Ajax-editing works, but is still missing the cool-factor without proper polishing. And like that isn’t enough, Siebrand has collected wish list for me. I will try my best to fulfil each request with my time which is limited especially now that study year starts again. It will be interesting to see where we are next year. 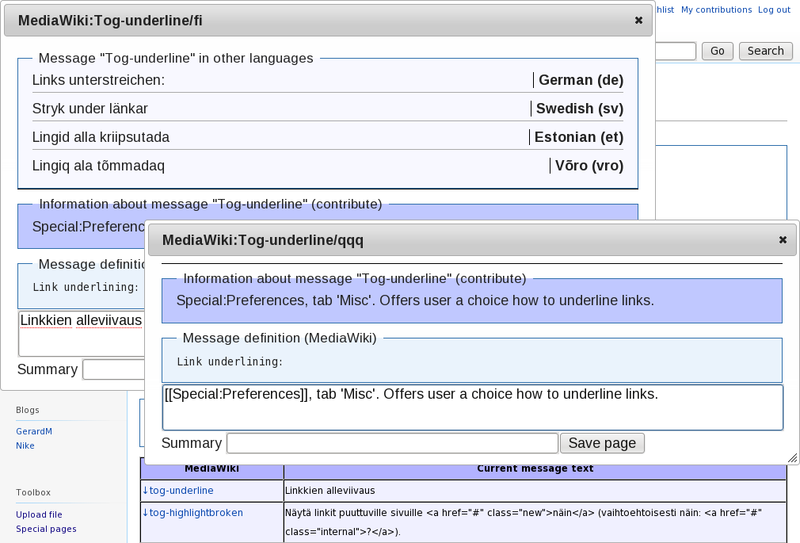 We are not alone any more and while other platforms are developing I want to keep translatewiki.net special – to give a face to internationalisation and localisation instead of being just a dumping ground for translations. You are currently browsing the It rains like a saavi blog archives for September, 2009.